Wikimapia, this genuinely awesome mashup of satellite imagery and user-submitted information, zooms right in on Reston's most famous landmark: our very own Targetville. This site is seriously good for hours of entertainment -- it identifies a couple of pre-Reston buildings we didn't know existed, plus it allows users to tag and add comments to a wide variety of Reston landmarks (hint hint hint hint). Have fun, and don't do anything we wouldn't do (hint hint hint hint). See anything interesting? Let us know in the comments. As the map clearly shows, there is no shortage of very affordable housing in Reston. Here is a great idea, don't build the new $150,000,000.00 health club at browns chapel and use the excess $8,000,000 in the RCC bank account to feed and house some of thoes folks. I like the really clever names for the CIA facilities on the corner of Sunrise Valley Drive and Town Center Parkway. 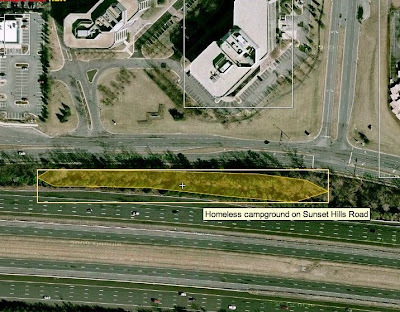 What's the facility on the corner of Weihle Avenue and Fairfax County Parkway?